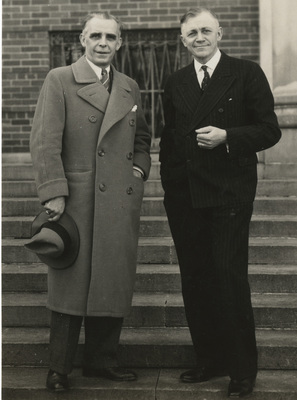 Dr. Anderson (right) and the director of the the Portland symphony, Van Ivan Hogastanner, stand on the steps of Melrose Hall. Unknown, "Dr. Anderson and Van Ivan Hogastanner" (1936). Linfield College Archives Photograph Collection. Image. Submission 177.